DETROIT (AP) — Corey Kluber continued his dominance of the American League Central, allowing two runs in eight innings as the Cleveland Indians beat the Detroit Tigers 9-2 on Sunday. Kluber (10-2) is 5-0 with a 0.76 ERA in five starts against division rivals this season and has won his last 11 decisions against teams from the AL Central. He allowed five hits and struck out eight without walking a batter. The Indians took the lead with two runs in the second. Francisco Lindor singled, stole second and took third when John Hicks’ throw sailed into centerfield. Yonder Alonso followed with a ground-rule double to left-centerfield to put the Indians ahead, and he scored on Cabrera’s one-out sacrifice fly. Martin’s groundout in the third brought home Hicks to make it 2-1 and end Kluber’s 20-inning scoreless streak against Detroit. Cabrera’s second sacrifice fly of the game, scoring Lindor again, gave the Indians a 3-1 lead in the fourth. 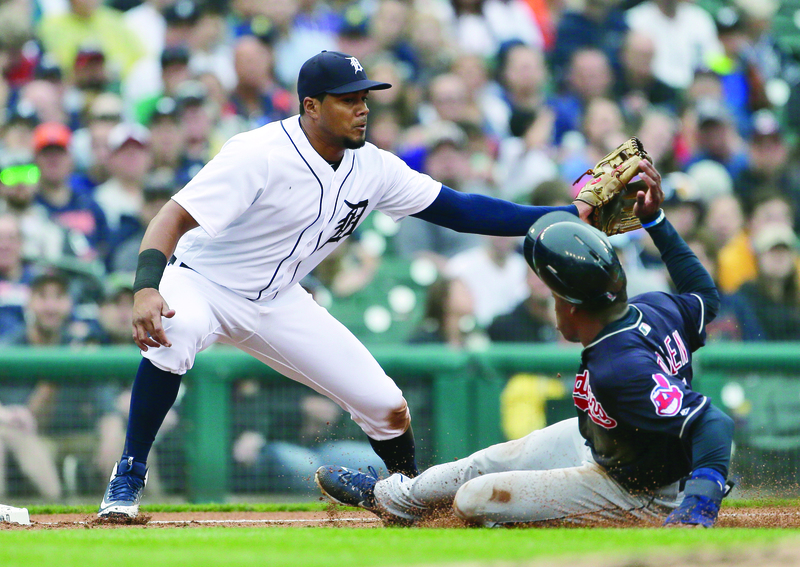 Martin homered in the bottom of the sixth to make it 6-2, but Cabrera drove in his third run of the game to restore Cleveland’s five-run lead in the eighth. Yan Gomes followed with his eighth homer to give the Indians a 9-2 advantage. Indians: 2B Jason Kipnis (neck) and 1B Edwin Encarnacion both took Sunday off to rest minor injuries. … C Roberto Perez left the game after being hit in the right wrist by a sixth-inning pitch. Tigers: C James McCann was scheduled to get Sunday off after catching 12 innings Saturday night, but was also dealing with flu-like symptoms. Indians: Cleveland travels to Chicago for a four-game series starting Monday. Lucas Giolito (4-6, 7.08) faces Cleveland’s Carlos Carrasco (7-4, 4.23) in the opener. Tigers: Detroit has a day off on Monday before starting a three-game home series with the Twins. Blaine Hardy (2-1, 3.66) takes on Minnesota’s Jake Odorizzi (3-3, 4.24) on Tuesday.